I have a drum carder – YAY!!! It really is a fiber tool, but it is so much fun that it is more like a toy – so I have a toyol 🙂 It isn’t fancy, but it is in great condition and was in my price range (not very much) plus it works awesome!!! 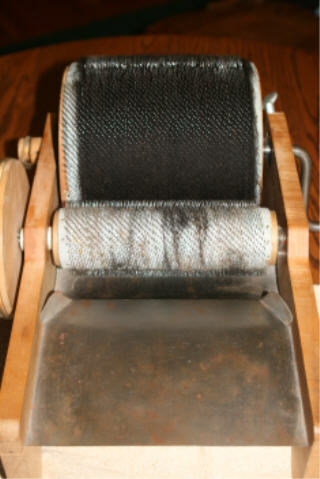 Using a drum carder is another way of preparing your fiber for spinning. Its more efficient than hand-carding, allowing you to card larger amounts at one time. It is best to use fleece that has been pre-washed, because it cards easier and puts less wear on the machine. 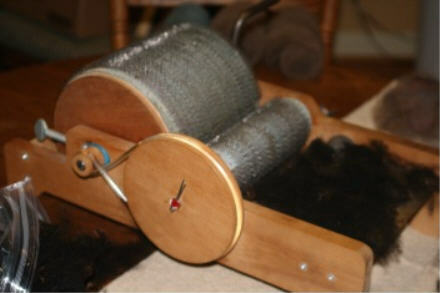 The drum carder can also be used for making fiber blends and working with colored fibers. I am really looking forward to making batts (large rectangles of fiber) that I can use for wet felting. 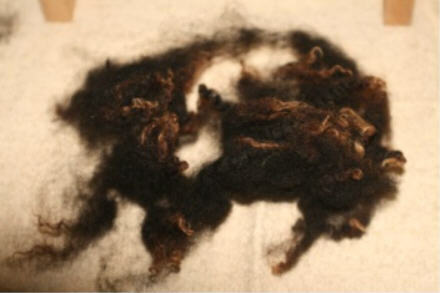 Here is some washed fiber. Gradually feed the washed fiber under the small roller. Open up the fiber ends to allow the fiber to feed onto the main drum evenly. Applying a moderate amount of weight on the fiber with your hand, as it feeds through the feeder – this also helps the fiber transfer to the main roller. Here the fibers are starting to transfer to the big drum. You can see the fibers starting to strech out and be combed in the same direction. Spread the locks evenly across the width of the drum until the drum is full. 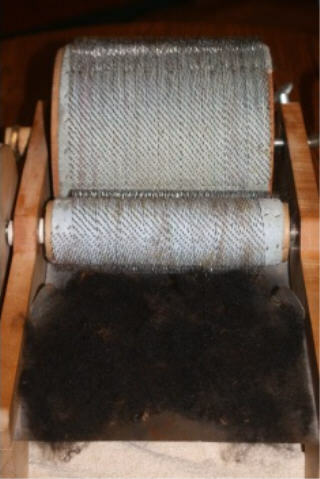 You can tell when the drum is full if it starts to overflow the sides of the main drum, or when the fiber begins to collect onto the small roller. 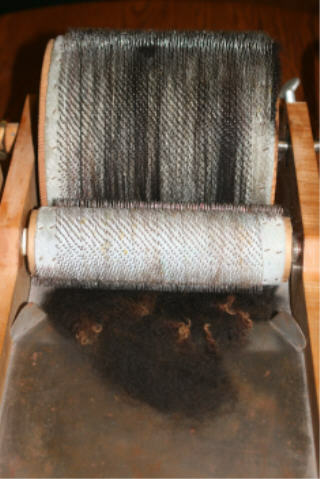 Once the drum is full, you can use a doffer pin (fancy name for a metal stick) to seperate the fibers and roll your batt off the drum. 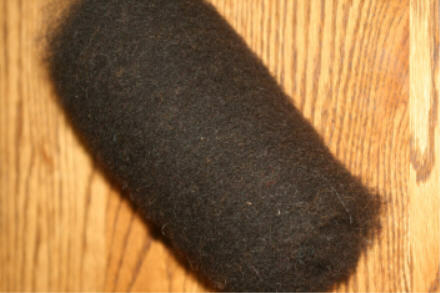 Here is the finished batt rolled up – wasn’t that fun! Flirt gives it her stamp of approval. Excellent! I got a Louet drum carder from eBay recently at a decent price. I haven’t used it much yet but shearing time is coming fast! I can’t wait to get going with it. 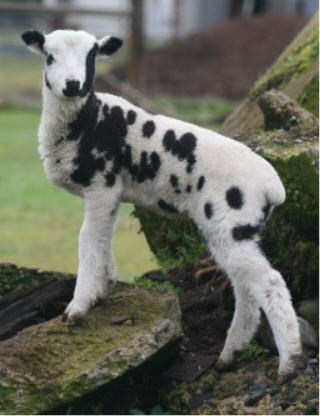 I have to send you some more pics of my lambs in response to your email. I’m picking a 3rd one out this weekend when we pick up 2 llamas from the same place, so I will look for another tight coat. How fun. I got a Clems and Clems from Ebay months ago in great condition but it was missing the belt. I found out they still have replacement parts on line and got one. Now they are starting up their old business again YEA…I would never pay full price for one, they want a fortune for them. Come on over and see my new lilac boys. I’m keeping one of them. Love, love, love my drum carder. Now I am looking for an affordable picker…..always another new toy to long for! But I do find my drum carder to be very practical, and it is also pretty..I think!